Pocket Lunch is a practical and compact highchair that is ideal to take on holiday or at at the grandparents' place and that allows the child to fell always safe and cuddled, just like at home! Product code 06079341570000 Mango Pocket Lunch is a practical and compact highchair that is ideal to take on holiday or at at the grandparents' place and that allows the child to fell always safe and cuddled, just like at home! To Recieve updates and possible rewards for Chicco Chicco Pocket Lunch High Chair - Mango please sign in. 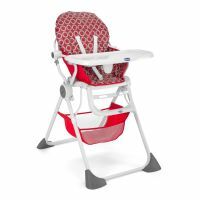 To Recieve updates and possible rewards for High Chairs please sign in.